In this post I will be discussing the benefits of witch hazel for oily skin. There are many products on the market that help reduce skin issues, especially acne. However, most of the products that one may purchase during their acne phase are made with synthetic chemicals, fragrances, preservatives, and other additives that do no belong on anyone’s skin. What is witch hazel? Witch hazel is a plant, the leaf, bark, and twigs are used to make medicine. Witch hazel may be applied directly to the skin for itching, pain, inflammation, acne, redness and irritation. Due to the chemicals in witch hazel when applied directly onto the skin, it may help reduce acne, inflammation, and fight bacteria. Therefore, if you begin to experience breakouts or are fighting acne, using just witch hazel may not be enough. That is why you will find many products that include witch hazel along with other ingredients to help fight acne. Witch hazel acts as an astringent to help shrink your pores, soothe your skin and reduce inflammation. It’s considered a natural astringent that will balance the moisture and oil in your skin. There are many benefits to witch hazel, however, this post will focus on the benefits for oily skin. It is important that if you begin to use witch hazel that before you actually apply it to your face that you test it on a small area near your neck to make sure you do not have an allergic reaction to it. I always wait to test any product 24 hours before implementing it to my skin care routine. As stated above, witch hazel is considered a natural astringent that contains tannins. Tannnins helps reduce the excess oil production on your skin. Witch hazel is also known to prevent dirt, dead skin cells, and acne-causing bacterial from entering and clogging your pores. This is one of the reasons why witch hazel is one of the most popular natural acne treatments and you can see that it is used in many over-the-counter treatment gels, toners, washes, and lotions. 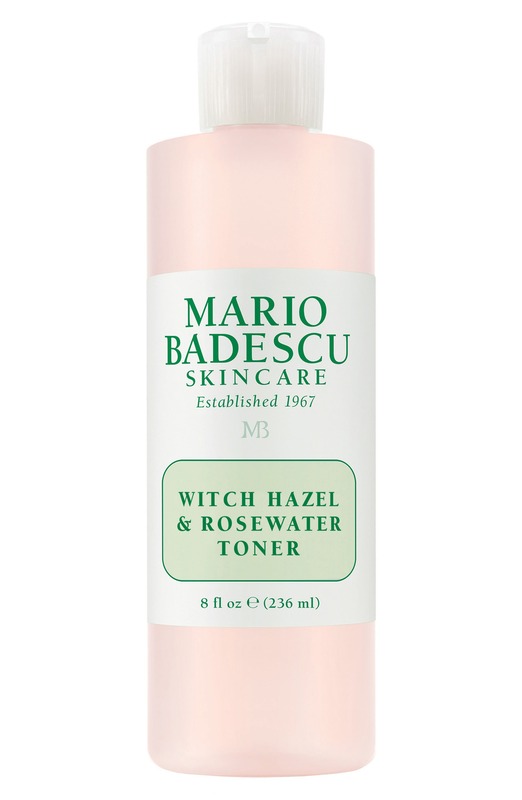 One of my go-to toners is from Mario Badescu. After cleansing my face I use this toner. Depending on the condition of my skin. When I travel I always carry this toner in a travel size. I’e noticed that when I travel for a week or longer my skin begins to experience breakouts. Furthermore, to avoid redness I make sure to carry witch hazel and my travel to-go toner. Due to it’s limited research, witch hazel has been used to treat redness and irritation due to its anti-inflammatory effects. Many people apply witch hazel to a cotton ball/pad and apply it directly onto the affected area. It’s important to test any product you will apply directly to your face on your neck at least overnight. There has been some research that suggests that applying witch hazel topically to sensitive skin may be beneficial in the treatment of irritated or broken skin. This product purifies the pores and instantly tones the complexion with a cool, refreshing application. After using this product I noticed that it reduced the redness on my skin and it also lessens the appearance of pores. This product is also enriched with Green Tea and Witch Hazel which is a win-win if you ask me. If you have oily skin or combination skin then using witch hazel on those shiny areas may help your skin care routine. Additionally, witch hazel can be used with a moisturizer for oily skin. There are many benefits why one would use witch hazel on their skin. Research indicates that witch hazel significantly removes excess oil and continues to control sebum levels over time. This is another benefit to using witch hazel to reduce the natural oils on your skin without drying out your skin. There are many products available on the market, however, you need to research and test the products that you decide to use on your skin. Everyone’s skin is different, yet we are all after the same thing CLEAR skin. Often when I travel I take this little magic primer stick with me because it really helps blur pores and any fine wrinkles one may have. This one is a secret of mine, I was once told about this product. I purchased it online and used it once and to my surprise, in the morning the blemishes were either gone completely or noticeably smaller. The price was also very reasonable and I knew I was not losing on any money if this product did not work for me. Witch hazel is an astringent that is often used as a natural topical remedy. It contains several compounds with potent anti-inflammatory and antiviral properties that help fight against acne and other skin issues. Thank you so much for your feedback. Yes, witch hazel is very useful for the skin. Witch hazel can also help soothe the rash on your skin. My skin is a perfect example of oily skin. My last visit to the dermatologist, I was told this was the major reason for my acne. I was prescribed a robbed which in my opinion only made the acne worst. Then I stopped and after some research, I decided to go natural. So its always a very happy day for me when I come across natural remedies for my skin issues. Thanks for recommending some products with the right blend to get the job done. Thank you, my post is to help those struggling with acne with products and natural remedies. I went to my dermatologist and she indicated that my skin had drastically improved. She was shocked on how clear my skin has become over the years. Let me know how witch hazel works for you. Thank you. I hope to continue recommending products that are beneficial. It is interesting how we land on a topic we had no idea would interest us. I never thought of Witch Hazel before this article. I can see how this might benefit my granddaughter who is in her teens. Teenagers seem to struggle with acne most of the school years. Your products listed here seem to make sense and by your article are quite effective treatment for oily skin. Would it be appropriate for a grandfather to buy Witch Hazel as a gift for a granddaughter or grandson for that matter? I have no idea what products if any she uses now. Maybe I should just send a link to this website and offer to pay for anything my granddaughter would like to try. I like the way you describe the product and look forward to checking back for your answers. Thank you so much for your feedback. Yes, acne is very common among teenagers. However, witch hazel can be purchased and given to your granddaughter. Witch hazel is also beneficial for all skin types. Let me know if you do purchase any of the items I have listed and the outcome. as I’m getting older I can see how my skin gets more irritation and redness, especially in my face, but actually lately all over it. I’ve never heard of Witch hazel and I’m glad I stumble upon your website because I learned so much about this plant that it’s contained in many easy to find products. I’ve contemplated trying e.L.f before and it seems like you have given me the perfect reason to do it. I’ll be happy to report the results I see. Thank you so much for your feedback. Please let me know which product you go for and the results. Great review about the Witch Hazel product and the information provided about it. I enjoyed the fact that this focuses on its benefits for oily skin. Oily skin whose greatest disadvantage is it can clog pores which often results in acne. This made the product more interesting as it can purify the pores and instantly tones the complexion with a cool, refreshing application. Great work putting this up, it think the product is even more amazing than your description. Hello Nia, your post is very informative. I have come to the realization that those that have oil skins are prone to acne breakouts. I have oily skin and often suffer from acne breakouts but it is usually prominent during my menstrual flows. It is quite interesting to know that which hazel has the wonderful features and the ability of reducing excess oil production from one’s skin. I particularly love the fact that it helps in preventing acne-causing bacteria from clogging one’s pores. I love the Mario Badescu skin care you reviewed, and I wouldn’t mind adding it to my regime. Thank you so much for your feedback. Mario Badescu products are great! Thank you so much for your feedback. Let me know once you get to trying witch hazel. You did a great job in sharing this article on witch Hazel on oily skin. I must say this is my first time of hearing or getting to know about this product. It good to know that it work for curing skin problems like acne and redness and other health benefits to the skin. I will an order for this so as to use for the acne on the back of little brother. It’s an informative article and this has been helpful. Thanks. Thank you so much for your feedback. Let me know how it works for your little brother. I like this witch Hazel and I believe it will be very effective when I give it to my cousin with some skin problems. The skin appears Rough and a little redish. He has used some creams on his skin but there was no improvement. I hope Witch Hazel will help restore his skin to its original nature. However, I would like to know if using Witch Hazel without any skin problem is wrong? I am waiting to have your honest response. Thanks. Thank you so much for your feedback. Let me know how it works for our cousin. Depends what you are using witch hazel for, I mean a lot of products contain witch hazel. However, you can add witch hazel in a spray bottle and spray it onto your face to get a “refreshed” feelings when tired/stressed. Thank you so much for your feedback. That is a question left for your primary care physician. I am in no way a medical expert and do not offer medical advice. However, when you get to asking your doctor would you mind letting me know? Thanks. Thanks for bringing this to my knowledge, oily skin has always been an issue for me, causing pimples, blackheads and other blemishes, I’m so glad i can across this post and will definitely use Witch Hazel to remove the excess oil and lift trapped dirt from your pores without dehydrating your skin. Thanks for bringing this to my knowledge. Thank you so much for your feedback. I hope it works wonders for you. I absolutely love this insightful article because it is full of great information. It is interesting how we land on a topic we had no idea would interest us. thank you so much for your article. I never thought of Witch Hazel before this article. This is fascinating and interesting to me. witch hazel is a plant, leaf and root used in making of medicine. It helps to soothe your skin and reduce inflammation. best Regards. Thank you so much for your feedback. Glad to have you on my website. Thank you so much for your feedback. Please let me know how it works for her. Hi, Your post has highlighted some facts about Witch Hazel that is common knowledge to many of my friends. If I suffer from any form of skin issue, I will not hesitate to apply Witch Hazel because I have seen many of my friends using the product and the result is fantastic. It is good when you have a problem, and you can find a product that can solve the problem. Or there is a product available for use that will prevent a problem from occurring. Witch Hazel is the product always to have handy especially when travelling. Thank you so much for your feedback. It’s always great to have a product that’s so handy when your skin is giving your issues. Thank you so much for your feedback. Let me know if you see a difference between witch hazel and tea tree oil.